Simply defined, brachytherapy is the technique of implanting radiation sources (Palladium-103 “theraseeds”) directly into the tumor – either alone or in combination with a revolutionary form of radiation called DART, when appropriate. This advanced process enables specialists to deliver the maximum-targeted dose of radiation to treat the disease effectively while sparing the surrounding tissue. Patients value the Dattoli Team’s combination therapy program for significantly reducing the chance of long-term side effects that other treatment options pose, such as incontinence (loss of bladder control), and impotence (loss of erectile function). Additionally, other more invasive surgical procedures have a higher risk of potential complications not to mention a considerably longer period of recovery. To answer this, we must start by exploring the disease itself. As you may know, prostate cancer may first be suspected following a digital rectal exam or a PSA blood test which can detect an abnormality. If a doctor suspects prostate cancer, a transrectal ultrasound-guided and biopsy is often used to verify and grade the cancer. If the biopsy is positive, doctors will perform further scans and tests to detect if the cancer has spread to any other areas of the body. In cancers confined to the prostate and surrounding region, the Dattoli Cancer Center utilizes 3-Dimensional Color Doppler Ultrasound to most precisely image the cancer. Meanwhile, currently only at Dattoli Cancer Center is “elastography” utilized which differentiates between tissue density to further evaluate cancerous lesions. This technology enables the Dattoli Team to view the tumor and organs from all sides, both for the purpose of cancer staging and to customize the best treatment programs when planning the positioning of seeds. 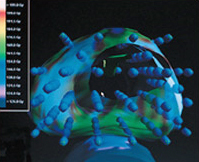 Seed placement can be intensified in the areas of highest tumor burden through the technique of Intensity Modulated Brachytherapy (IMBT). Also seeds can be placed in extracapsular locations to extend the reach of the dose cloud. This method was pioneered by Dr. Dattoli, and has been utilized and refined since its inception more than a decade ago. The most advanced of these treatments uses IMBT in combination with DART radiation therapy, to achieve the ultimate in tailored dose delivery.